Moringa oleifera is a plant that has been used for its health benefits. People using moringa in India over thousands of years. It is very rich in healthy antioxidants and bioactive plant compounds. The leaves, bark, flowers, fruit, seeds and root are used to make medicine. Moringa leaf Powder is a unique superfood. The powder of Moringa Oleifera leaves (commonly known as the drumstick tree leaves), a host of vitamins, minerals, nutrients, anti-oxidants, amino acids, protein, iron, calcium, magnesium, potassium, fiber, phyto-nutrients, etc. For all the herbal tea lovers out there, Organic Veda brings to you the goodness of Moringa tea produced with utmost care and superlative diligence. This herbal tea is a special, exotic blend of certain cherry-picked herbs that assist healthy life. Consumption of Moringa tea helps you lead an active lifestyle. The delicate blend of effective herbs in this tea gives your body the necessary nutrients required to keep you energized throughout the day. Best Selling Organic Moringa Tea throughout the world. General Wellness - Natural & Organic Product, Increases the Natural Defenses of the body, Promotes Cell Structure of the body, Rich in Antioxidants, Increases Energy level and keep you healthy. Anti-oxidants neutralize free-radicals in the blood. Moringa leaves powder is so powerful in this aspect that it is simply unmatched by any other thing because of its Oxygen Radical Absorbance Capacity (ORAC) value of 1,57,000 umole TE/100g (hydrophilic and lipophilic. Place 1 teaspoon / per person (Approx 2g-0.07 oz) loose tea in a tea pot and add a Cup (120ml) of water. Heat it to boil. Take out the tea pot and steep for 2 Minutes. Stain and Gentley Squeeze the loose tea to fully release the active ingredients. We currently have no information for moringa tea side effects and Interactions with food or medicines. However, Before drinking Moringa tea, please consult your healthcare professional. For Individual consumption, People may prefer moringa tea bags instead of moringa tea leaves. 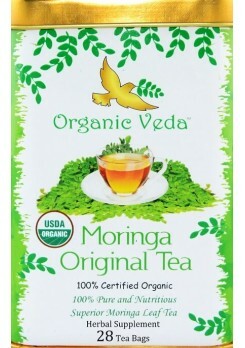 We recommend to do purchase Organic Veda’s Moringa tea basg. It Contains 28 sachets Organic raw Natural Moringa tea. To ORDER, please click Moringa tea bags and Buy your Moringa today!